Bowls Medals with free engraving - get cheap medals here at Aford Awards! Do you want to reward someone who has a love for bowls? Maybe you want to reward someone in your team for their skills and commitment to the game? Whatever your reason, our bowls medals are a fantastic way of rewarding an individual in recognition of their hard work and dedication to the game. At Aford Awards, we want to help you to find the best possible medal at the best possible price. We can provide you with top quality, value-for-money medals that will be appreciated by all. We’ve been supplying trophies, medals and awards to bowls teams for many years. Whether it is a hobby or professional, your love for bowls should be rewarded with something that can be treasured forever. With over 30 years experience, we have firmly established a reputation for being one of the leading trophy suppliers in the UK. We are very lucky to have worked with some huge companies and have a very loyal client base. We have a wide variety of bowls medals and designs to suit your unique taste ranging in gold, bronze and stainless steel. Each design can be tailor made to your order using our free medal engraving service. Our vast range of medal designs and unique engraving service means that there will always be a medal suitable to your requirements and bespoke to the recipient. 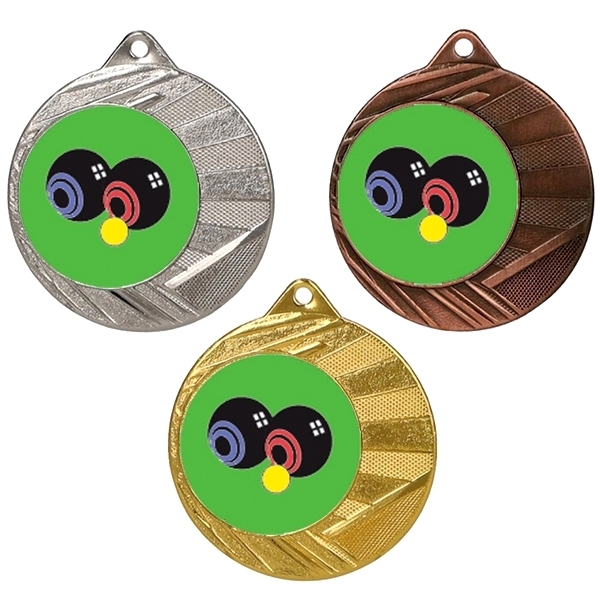 Our bowls medals are suitable for all different achievements and occasions whether you are rewarding someone for player of the year or winner of the match - we will have something for you. We pride ourselves on offering the best possible prices for all of our products and engraving. We believe that we supply high quality products with a unique price tag and service, therefore not only do we promise to give you the best price available, but if you find a better price elsewhere for an identical bowls medal, we will beat the price b 5%. We ensure that we use the most premium materials available for all of our products to ensure that each purchase remains looking as good as new for years to come. We can guarantee that you will not find a better price for the same quality anywhere else and invite you to challenge us if you do. All of our products come with a free engraving service to enable clients to personalise items completely free. There is a chance for you to get really creative in the 60 character limit or to simply add the recipient's name and reason for receiving the medal. We also provide a premium engraving service for all other items that you may want personalised. Our cutting-edge engraving machinery can engrave even the most delicate items - from jewellery and watches to tableware and stationary - if you want it engraved, we can make it happen! If you have any enquiries about our bowls medals, engraving service or any other of the trophies, trophy cups and medals available, simply get in touch today on 01622 738711 to speak to one of our team of experts. Alternatively, you could take a look at our bowls trophies for more inspiration and options that may be more suitable to your requirements. If you're unable to find what you're looking for, take advantage of our bespoke medal service which enables you to create a one-of-a-kind trophy.